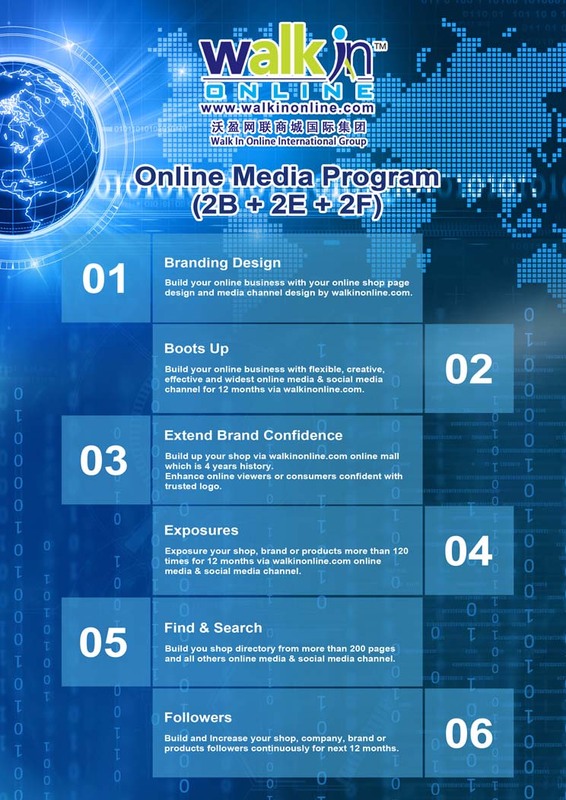 Online Media Program (OMP) Service Provider Organization at Malaysia, Singapore, Hong Kong, China, Indonesia, Thailand and others country. Build your online business with your online shop page design and media channel design by walkinonline.com. 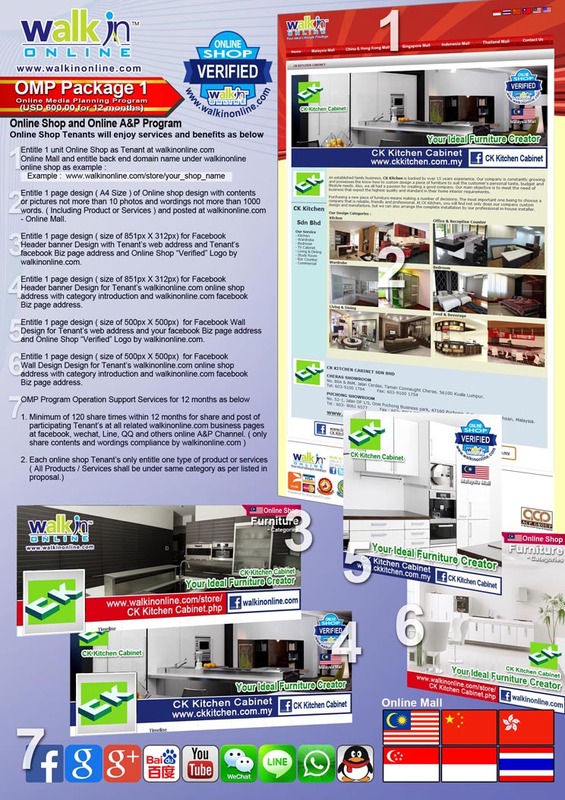 Build your online business with flexible, creative, effective and widest online media and social media channel for 12 months via walkinonline.com. Build up your shop via walkinonline.com online mall which is 4 years history. Enhance online viewers or consumers confident with trusted logo. Exposure your shop, brand or products more than 120 times for 12 months via walkinonline.com online media and social media channel. Build and Increase your shop, company, brand or products followers continuously for next 12 months. 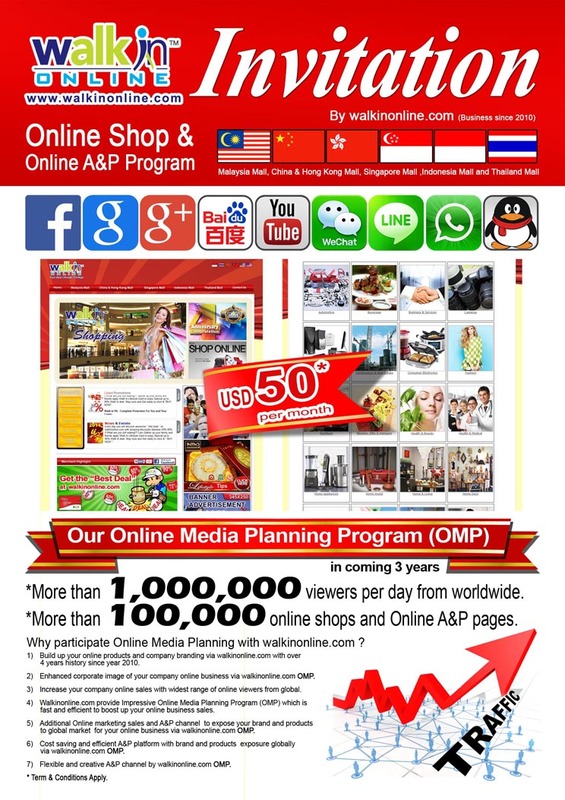 Build you shop directory from more than 200 pages and all others online media and social media channel. You can Enjoy Guaranteed Cheapest Hotel Rate or Price For Online Hotel Reservation on Over 100,000 Resorts or Hotels Worldwide. Malaysia Largest General Insurance Risk Management Solution Provider since year 1989. Partnership Insurance and Malaysia Insurance Protection. Hello Holidays Always Make your Travel Happier! At Hello Holidays, our conviction is to provide top quality tour products & services that eliminate hassles and worries to ensure your travel is smooth, truly enjoyable and becomes a memorable one through out your life. We always serve you with 'Passion'. Remember! Hello Holidays Always Make your Travel Happier! SEC Electricare Hub which is the largest electrical chain store hub in Malaysia. Category : Fashion, Men, Women, Apparel, Leather Wear, Eyewear, Fashion Accessories. KN KEY NG offers ready- to- wear apparels and accessories, Ladies and Men Apparels, Bags, Shoes, Belt and Eyewear. With an eclectic mix of modern executive attire and smart casual wear, it caters young to middle age customers who are looking for quality, comfortable and fashionable wear. Key, means access and essential. To him, fashion is the key to his life. Fashion colors his world with passion, happiness, hopes and enthusiasm. He lives his life with the most modern and trendiest designs and persists to bring the best to fashion lovers. As a growing teenager, this Malaysia born Chinese designer, who hails from Perak State doodled everything from people to vehicles. His love in drawings eventually led him to his lifelong love affair with creative fashion and clothing. Thus, with a desire to fulfill his dream and a passion to make every other individual look good, he furthered his study and graduated from Singapore Nanyang Institute of Arts in year 1990. After that, he joined Bobby Ch’ng, one of the well known Singapore Designer’s company for 2 years to work and learn at the same time. With experience gained from Singapore, he finally decided to strike out his own label back to Kuala Lumpur, Malaysia. With lot of hard work and sheer determination, he now owns a very successful fashion empire in Malaysia with boutiques and counters over Klang Valley and Penang Island. We Specialize In :Kitchen Cabinet, Wardrobe, Study Table, Shoe Cabinet, File Cabinet, Kitchen Design, Kitchen Specialist, TV Console and all others fix furniture and fitting and cabinet. 2P,Jalan Zoo,Bandar Baru Air Itam,11500 Penang, Malaysia. Sole-Distributor of X-Five product such as ATX Casing & Gaming Casing and Power Supply. Telecommunications Products and Services and Wholesale and Retail Outlets. Murah Bagi Tau Member !!! Mahal Bagi Tau Kami !!! We Specialize in: Kitchen Cabinet , Wardrobe, TV Cabinet , Display Cabinet. D-45-2, Dataran C180, Balakong Cheras, Selangor. Hyundai Healthcare and Wellness Equipment, Household products and Home Appliances Equipments and products fully imported from Korea. Taman Maluri Cheras , 55100 Kuala Lumpur . Keep your car running like new. Want to know how? Call and book a session now!!! Shop, dine, go for a movie or just chill with loved ones this weekend in Sunway Pyramid and The Gardens Mall while our professionally trained Technicians attend to your car service! Regular car servicing is definitely not a “want” but a “need” as it prevents one problem from creating a string of others and ensures that your car is running at its peak. When your car is in a tip top condition it uses less fuel, is more efficient, is safer to drive and lessens pollution to mother earth. In simple words, regular car servicing saves you money. CITICARS is a first of its kind new concept of lifestyle car servicing where we bring a “Need” of the consumer to a shopping mall’s car park! Just send in your car for service, go shopping, dine, go for a movie, buy your groceries or simply enjoy quality time spent with loved ones in the shopping mall and conveniently drive home safely in your fully serviced and reliable vehicle. service your car conveniently whenever you are in a Shopping Mall. we practice fixed pricing policy with our service charges reasonably priced according to models and car conditions. we use only original and genuine lubricants and parts, despite our competitive pricing, we do not comprise on our quality standards. our team of Sales Advisors and Technicians are professionally trained to serve your car servicing needs. Citicars is now the official panel workshop of the Malaysian Audi TT Car Owners Club which was formed in the year 2011 and officially registered in the month of April 2013. The club’s objective is to gather all audi tt car owners & fans together, having fun of convoy & gathering events, sharing knowledges / experiences on service maintenance as well as modifications & performance upgrades. Members get to stay closely connected, getting first hand info on invitations to all events, privileges to enjoy special deals & promotions offered by panel workshops. Provide Quality Services on complete Corporate or SME Mobile Plans Solutions, Fixed Line Saver (FLS) and Business Kits to meet all your company's needs. powered by Broadband Power SME Team. Private Structure Brand for lounge wear、casual wear and gym wear and all others underwear products (Male and Female). New counter @ Parkson, Nu Sentral, Kuala Lumpur. are convinced that their outlets are still able to meet the demand of from the country. including baby rompers, sweaters, cardigan, jumpers, pyjamas, diaper, dress, suit, etc. our penetration into the European market includes United Kingdom, Denmark, Hungary, France, Norway and Switerland. event and portrait and Printing for Offset and Injek, Furniture supply. Deboch Power Bank Series for mobiles and tablets. Deboch i5200 - 5200mAh , Germany Product with International recognize quality certification and come with INSURANCE cover up to RM 1million. We are distributor of Deboch Power Bank series for mobiles and tablets. Wedding Gowns . Evening Gowns . Bridal Dress . Makeup . Beauty Services . Wedding Photography. Beautiful custom made bridal gowns for your big day. We are a breastfeeding friendly confinement centre and the first confinement centre in Malaysia advocating "Scientific approach in confinement care". The I27 International Sdn Bhd main goal is to provide Beauty & Healthy Products for customers. Jinjang Utara, 52000 Kuala Lumpur,Malaysia. Flower Directory, Hampers & Gifts Information and Tips, Corporate Gifts Directory. Shirley Florist provide fresh flower everyday, Send Flowers to Your Loved Ones via Shirley Florist Online ,floristkl.com is Malaysia Best Florist Shopping shop. For fresh, high-quality flowers in Kuala Lumpur, you can count on Shirley Florist. We are located in Ampang about 1 block from the intersection of Jalan Ampang and the Middle Ring Road II. If you’ve located Ampang Grocers, we’re only 30 meters away. We’re on Persiaran Ampang between Ampang Grocers, at the corner, and the MRR2 (Middle Ring Road II). AppleTree is a professional brand exclusively devoted to the production of electronic dictionaries. Malaysia Errors & Omission Insurance and Malaysia Liability Insurance. specializes in property maintenance and management. We have a proven track record in managing condominiums, office and commercial buildings. Our goal is to provide quality and efficient building management and maintenance services with systematic billings and collections of service charges as well as prudence financial and budget control. Malaysian property management companies are required to re-evaluate their management and maintenance approach because of increasing advancement of facilities, qualities of stratified properties and the ever progressive demands of owners and tenants. As there are no standard management and maintenance for the upkeep and improvement of the property complex, it will be your advantage to have a professional partner, who is able to offer your property complex appropriate tailor-made and cost-effective solutions. After a thorough humane and micro analysis, we will ensure that you have all procedures in place both at improvement and operational levels. Through these services you can benefit from structural and operational property management arrangements. In property management you faced with many problems that cannot be solved and should therefore be managed. - PAMA SERVICES SDN BHD vision is to strive for the highest quality using the best level of professional expertise, with focus on organization oriented solutions. To enhance and further improve owners and tenants living comfort, improve surroundings, enhancement of property and operate. Whilst being available for advice and assistance by just a phone call away. Your demand is our pleasure. Category : Home & Living, Consumer Products, Household, Lifestyle Products, Manufacturer. Benden Production Sdn. Bhd. was registered in 1994. Core business in design and manufacture of bed sheet set, comforter, quilt, curtain, cushion, pillow, bolster, mattress protector, kitchen accessories, baby overall, and all kind of home furnishing products. To accommodate with different living concept, Benden's in-house and licensed brand names include Benden, Chester, Chester Kids, Kazuko, Roma, Dreamword, Textra, Smiley, Disney Princess, and Disney Baby Pooh. Get yourself "cooked up" in front of the chef as he takes your order... and maybe you can even learn a few skills in cooking a teppanyaki dish next time. Our food ranged from grilled to hand made sushi rolls, you’ll be amaze of large variety of foods to choose from. Don’t just sit down... Come visit us right away. locomotive cooling systems and all others relevant customized application. Bestweld Steel System Sdn Bhd (BSS) is a Malaysian-owned company with extensive hands - on experience in Light Gauge Steel construction. Manufacturer for all kinds of knitted product. welding studs, splice couplers and wrenches for construction industry throughout the Asian region. 47180 Puchong Jaya, Selangor D.E. No. 28-7, Jalan Loke Yew, 55200 Kuala Lumpur, Malaysia. AH WAH TIN SMITH extensive experience in Fabrication works mainly on RAIN WATER PRODUCTS such as rwdp, gutters etc. Our Company also cover all kinds of mild steel work and provides customers service with highly skilled staff on the installation works for industrial Construction, environment facility such as housing staircase handrail, mild steel fencing, mild steel gate, grille and etc. Premium Raw Wild Honey Specialist. Natural, Healthy and Delicious. Pure or money back guarantee! Call +6017-3009888 for auditions, wholesale and bulk purchase. Hong Zi Construction Sdn Bhd had completed more than RM180 Million worth of Contracts comprising of high-rise buildings, factories, houses and infrastructure works and dealing in building and civil engineering works nationwide since year 1996. Click "Like" page here ! Baskin-Robbins Pink Wednesday promotion today ! walkinonline.com will reserved the right and not responsibility for all related shared information at walkinonline.com business page. All related information are from others business owners. All related information are not related business with walkinonline.com and all related information may change, amend, remove, delete or remove by related "share info-owner". Located : Kampung Baru Ampang, Ampang, Selangor. A-6-G Merdeka Place, Jalan MPL1, Off Jalan Merdeka, Kampung Baru Ampang, 68000 Ampang, Selangor. in Kampung Baru Ampang, Ampang, Selangor. trading of spare parts/ car accessories. SB Car Auto Service Center is the place where you would rely on when it comes to vehicles, no matter whether it is just for a free inspection or an advice in an emergency situation. It is the place where you know your car is safe because at SB Car Auto Service Center, we really care for your safety and comfort. 17 ,jalan dayang 8/8 , Seksyen 8 ,bndar mahkota cheras ,43000 kajang Selangor. Malaysia Largest Branded Fashion Event Organizer. Branded Fashion, Apparel and Accessories Warehouse Sale Event Organizer all over Malaysia. 68-1, Persiaran Bayan Indah, Bayan Bay, 11900 Sungai Nibong, Penang, Malaysia. Interior Designs Directory, Construction Build Information, Home Furniture supply tips. Category : Interior Design, Home & Living, Furniture, Renovation. Interior Designs and Construction Build, Photography for wedding, event and portrait and Printing for Offset and Injek, Furniture supply. to create a lovely home to everyone and capture down all precious moment of everyone. 4. Furniture supplier (custom made 1 set sofa or any others furniture with quantity). as if in any further information, don't feel hesitate to leave us and message or email at 4interiordesigns@gmail.com. We will get to you soon. so we help to make your home sweet, and photographing to capture down your happy memorable moment. Food & Beverage Directory, Wholesale Supplier Information and Tips, Food and Beverage Supplier Directory. Category : Food and Beverage, Wholesale, Consumer Food Products. Wholesaler, Supplier, Distributor in Malaysia, India, Sri Lanka and Indonesia. Products Brand : Nam Yang, Teh Boleh, 111 Triple One. 5 Jalan Meranti Jaya 8, Taman Meranti Jaya Industrial Park, 47100, Puchong, Selangor, Malaysia. Contact No : +6017-8711993, +603-80600913, +603-80527335. Malaysia Insurance Directory, Malaysia General Insurance Information and Malaysia Insurance Services Directory. 371, Jalan Ampang, Batu 4, 50450 Kuala Lumpur, Malaysia. 124A, Jalan Kasah, Medan Damansara, 50490 Kuala Lumpur. Address: Lot 1064 (Plot B), Batu 23, Jalan Batu Arang, 48000 Rawang, Selangor. Address: 61, Jalan Jejaka 7, Taman Maluri, Cheras, 55100 Kuala Lumpur. 10, Jalan 1/67B, Off Jalan Mengkudu,Jalan Ampang, 50450 Kuala Lumpur, Malaysia. Address: B-11-1, Sunway Giza, Jalan PJU 5/14, 47810 Kota Damansara, Selangor. Address: 37, Jalan 11/62A, Bandar Manjalara, 52200 Kepong, Kuala Lumpur, Malaysia. Address: Kompleks Sogo, 190, Jalan Tuanku Abdul Rahman, 50100 Kuala Lumpur, Malaysia. Address: 103, Jalan Jejaka 9, Taman Maluri, Cheras,55100 Kuala Lumpur, Malaysia. Starz Kitchen offers an array of traditional Cantonese delicacies. Currently with openings in Hong Kong, Shanghai, Macau & in Pavilion Kuala Lumpur Malaysia.